Just wanted to "Let U Know"! Hooray! Nacional Records, US home of Manu Chao, Nortec Collective, Los Amigos Invisibles and other alternative Latin artists released our video for Plastilina Mosh's single "Let U Know" this week. 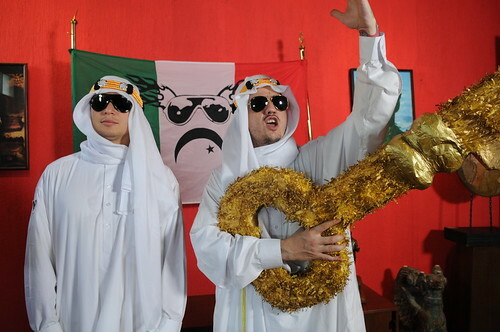 Director, Brian Liu and cameraman/editor Greek Prince went down to Monterrey, Mexico to shoot the video. PMosh have been friends of ours for about 9 years, and we've also known our producer, Chuy, for years from DJing at La Santanera in Playa Del Carmen. Jonaz came up with the initial concept of dressing the band like sheiks to see what kind of reaction we would get from people in town. In the end, our base concept centered around a fictitious country of sheiks who BUY Mexico, so the first thing we did is design the fictitious new country's flag and gather props. The rest came together PMosh style! Many thanks to Dan Cooper for helping Brian and Nikos with the edit. Here's a flickr set (click for full set) of some press/production photos Brian shot on set.